Are you following me on Instagram? 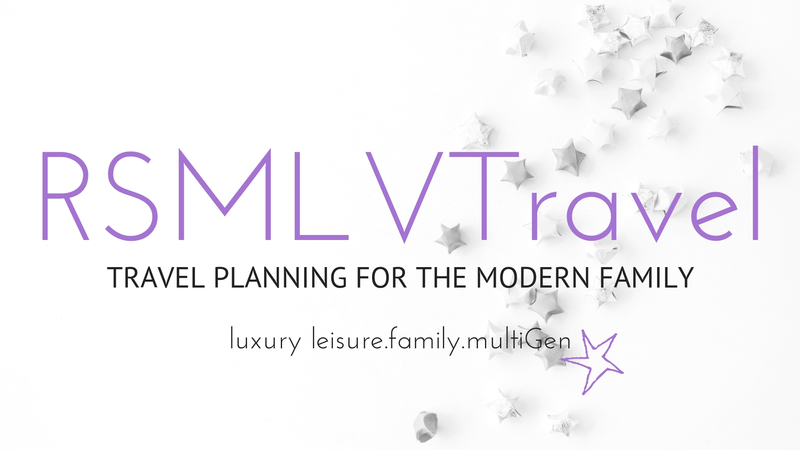 @RockStarMomLV to keep up with our life’s travel + lifestyle adventures. Los Angeles. The name just sounds intimidating. The traffic. The freeways. The millions of people. Where do you stay? What do see? Where do you eat? These thoughts plague my mind every time I think about navigating my way through this monstrosity of a city. My daughter, however, is an aspiring actress, at least in her 8 year old mind. 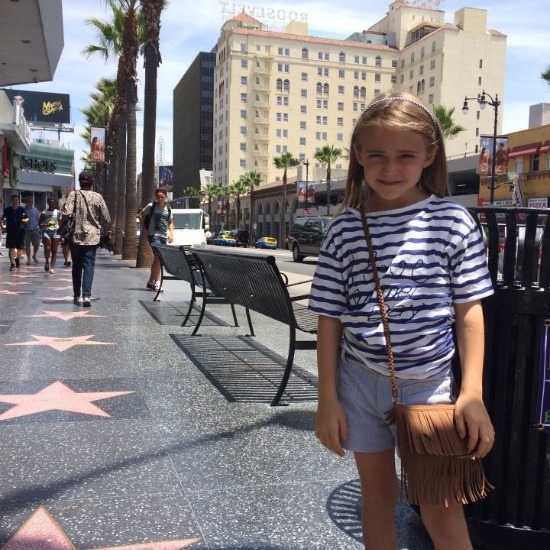 She wanted nothing more than to spend a day with mommy in none other than Los Angeles. Since we have friends who live there, we took advantage of their generous offer, and spent two nights with them so Stella and I could see the sights. Fortunately, we had been to L.A. a few times, like when we spent the day at American Girl Store at The Grove for her birthday. We had also done a beach day in Marina del Rey, and the Natural History Museum in Downtown Los Angeles, which made it a little easier to narrow down our choices. 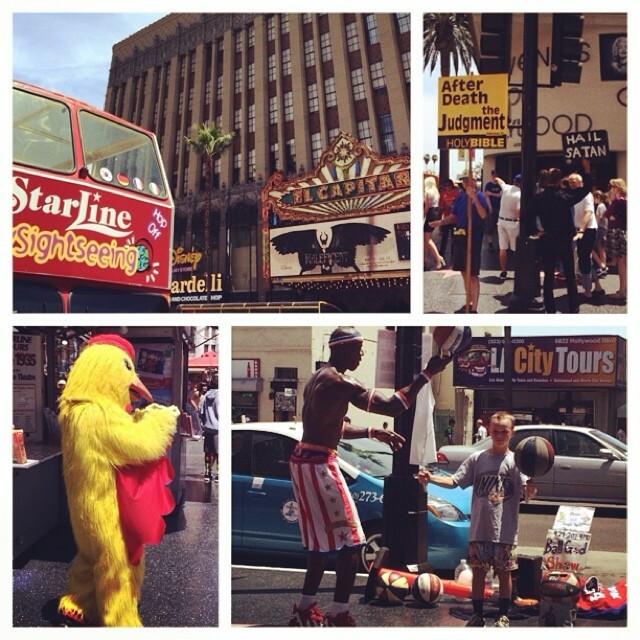 Hollywood was a non-negotiable, so we filled one complete day with a trek up and down Hollywood Boulevard. Since we were traveling from Dana Point, California to Los Angeles, we agreed to leave in the morning with the goal to make it there by lunch. L.A. traffic can be unpredictable, and if caught in it during the wrong times, unbearable. Fortunately, when we left Orange County at 11am on a Saturday, we had a pretty uneventful ride straight into Hollywood. We arrived around noon, and had planned on having lunch at the trendy burger bar, 25° at the historic Roosevelt Hotel. Trendy and chic decor, with a sophisticated twist on the traditional burger, my daughter and I enjoyed every bite. Of course, she made me sit at the counter, which the bar stools were not the most comfortable. But, the food was yummy, and I loved how we sat with the windows open to Hollywood Boulevard, creating images in my mind from the early years when anyone who was anyone could be seen walking down the street to one of the premier theaters or restaurants. We had fun looking up historic facts about the Roosevelt Hotel, too, while waiting for a pretty delicious offering of pommes frittes and grilled cheese with three cheeses. Stella had a bruger the size of her head and served on a brioche bun, which is now my favorite way to indulge in these American classics. Oh, and the handmade shakes were pretty scrumptious as well! 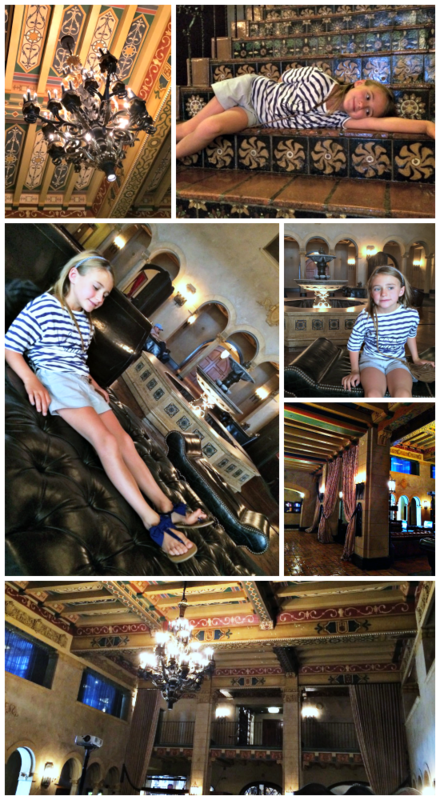 After lunch, we wandered through the lobby of the Roosevelt Hotel. Built in 1926, and financed by a few Hollywood elitists, it was recently renovated in 2005. Vegas Fun Fact: the hotel renovation was overseen by Dodd Mitchell, the same man responsible for the design of Javier’s Mexican Cantina inside the Aria Las Vegas. 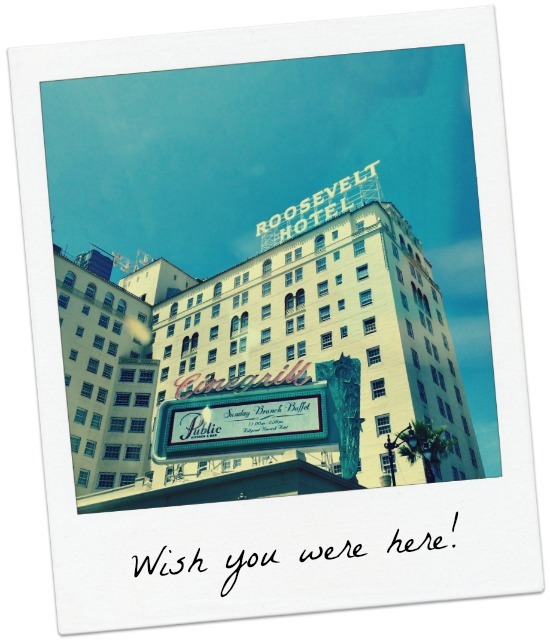 The Roosevelt Hotel itself is known for its famous Hollywood clientele and parties thrown back in the glory days. The first Academy Awards was held at the Roosevelt. Marilyn Monroe was a resident at the beginning of her career, and it is said her ghost is seen and felt wandering the halls of the hotel. We didn’t get a chance to see the rooms or the infamous pool, but what we did see in the way of architecture and design was gorgeous. Colonial Spanish influences throughout made the hotel feel like I was entering a past era. Stella and I couldn’t get enough of the lobby. We finally made the trek to the great outdoors- Hollywood Boulevard. A very sunny day in July, the sun felt even hotter and shined a little brighter that day. 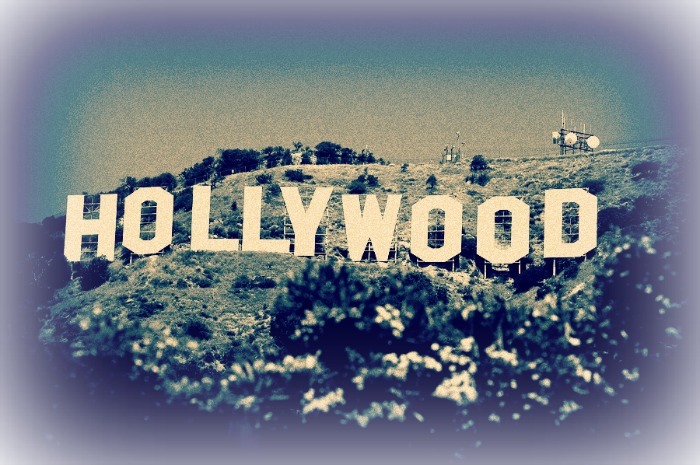 The sidewalks were jammed packed with people and their cameras, making sudden stops to get a quick snap of a celeb star on the Walk of Fame, footprints in front of the Chinese Theater, or the oddity that makes Hollywood Boulevard, Hollywood Boulevard. At first I was a bit unsure of whether or not my daughter was too young to be down there, but when I glanced over and noticed how she was taking it all in, I changed my mind. 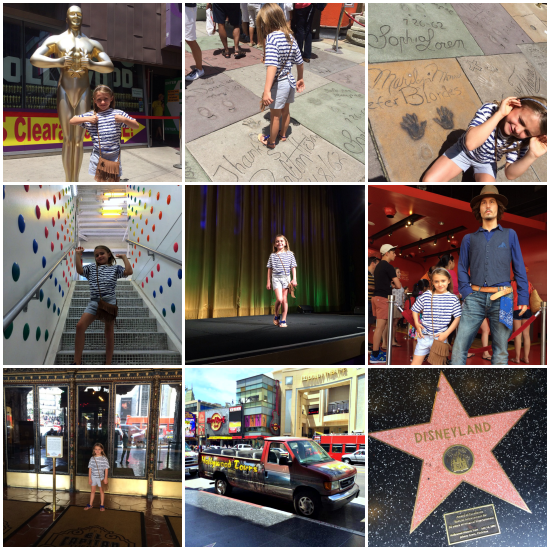 Like her mommy, she and I are enamored with the history of the places we travel to, and Hollywood is no exception. Just the main street feels so filled with ghosts and their stories that glamified the industry and kept us entertained infinitely. – Parking: Parking is not cheap anywhere in L.A., and unless you have the patience, which I do not, to drive around and look for parking in ally ways, you will have to pay to park somewhere. We chose to valet at the Roosevelt Hotel and have lunch. There is no validation, and it cost us around $30 for 6 hours. There are public parking lots available, and some will offer validation for a few hours if you shop or dine at a particular establishment. 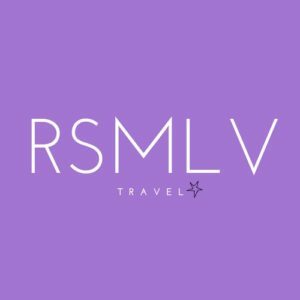 – Lunch: We chose the Roosevelt Hotel because we had the historic and architecturally interesting property on our itinerary. There also happened to be a yummy burger bar, 25°, at the front of the hotel, so we made our day work around parking, hotel visit and lunch. The least amount of driving that needs to be done, the better. Plan on parking and walking for a few hours. It is one of my favorite ways to see the sites, and makes for a more enjoyable day with less stress. 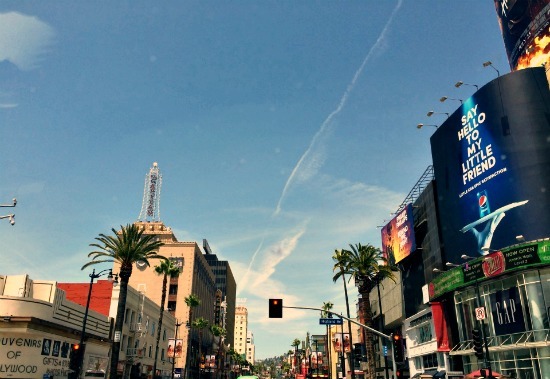 – Site Seeing: Walking up and down Hollywood Boulevard is truly the best way to see it. We started out from the Roosevelt Hotel, and took advantage of the Walk of Fame right outside. Following that up one side of the street, crossing over, and following the stars up and down the opposite side, led us on a tour of some popular sites: TCL Chinese Theater (formerly Grauman’s Chinese Theater), Madame Tussaud’s Wax Museum, and the Dolby Theater (formerly Kodak Theater). Crossing back over to the Roosevelt Hotel side of Hollywood Boulevard is Disney’s El Capitan Theater and right next door is Jimmy Kimmel Live!. Theater tours can be arranged at some of the locations, with advanced notice and purchased tickets. I would highly recommend seeing a movie at the El Capitan Theater- it is an experience like no other. As a member of the media, I was given a special backstage tour of the El Capitan Theater, along with tickets to view the 3D show of Maleficent. All other adventures through Hollywood Land were curated and paid for on my own. All thoughts and words 100% belong to me. 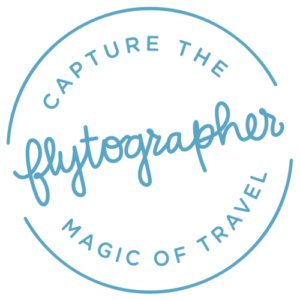 Instagram Travel Thursday :: One Day in Hollywood is linking up with the Instagram Travel Thursday community today. Visit other interesting and desirable places through the eyes of fabulous travel story tellers on Instagram using #IGTravelThursday. This series is sponsored by Skimbaco Lifestyle. 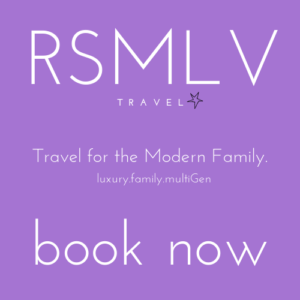 Follow me on Instagram @RockStarMomLV. I always LOVE spending the day in Hollywood! You guys are too cute! Fun!